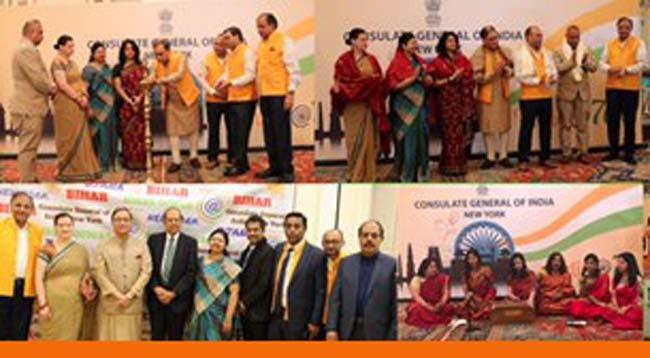 The Bihar Jharkhand Association of North America (BJANA) celebrated “Bihar Diwas” for the first time at the Consulate of India in New York on March 18th, 2018 to commemorate the 106th anniversary of the formation of the Bihar state. More than 200 people from different parts of North America attended the function to show their pride and appreciation for their rich cultural heritage of Bihar. The function commenced with the lighting ceremony by Mr. Vinay Singh, President of BJANA, Dr. Avinash Gupta, Vice President of BJANA and honorable Consulate General of India in NY, Ambassador Sandeep Chakravorty. Mr. Sanjeev Singh, Secretary of BJANA, welcomed all guests and thanked them for their participation. Mr. Alok Kumar, a BJANA executive committee member and the Executive Vice President of FIA recognized and applauded the achievements of some of the prominent BJANA members. The cultural program, consisting of songs in Bhojpuri and Maithili and dance performances by children, was the major attraction of the function. BJANA executive members shared a few words about the event and vision and mission of BJANA . Mr. Anurag Kumar, Treasurer of BJANA, presented a list of accomplishments and encouraged BJANA members to actively participate in philanthropic and charitable causes of BJANA, both in the United States and in home states (Bihar and Jharkhand) in India. The cultural function concluded with a video presentation on the history and achievements of Bihar. The cultural program was followed by lunch, comprising of an exquisite and ethnic Bihari cuisine, which gave all participants nostalgic feeling of celebrating “Bihar Diwas” in Bihar. The Chief Minister of Bihar, Mr. Nitish Kumar, has sent his best wishes to BJANA and has congratulated the members for their constant efforts and interest in maintaining their identity. BJANA also celebrates Holi and Diwali festivals every year and successfully organized Chhath Puja for the first time in Oct, 2017. The Puja was attended by a large number of people of Bihar and Jharkhand origin. The vision and mission of BJANA is to integrate the communities of people from Bihar and Jharkhand through the celebration of cultural festivals, and philanthropic and charitable initiatives / activities in North America and home states of Bihar and Jharkhand. Members of BJANA executive committee are committed towards the vision and mission of BJANA.